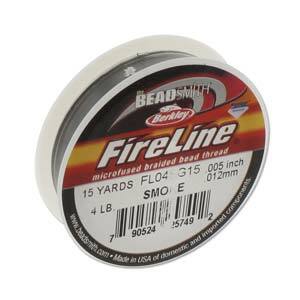 Berkley Fireline is a gel-spun polyethyline that is braided then thermally fused thread for a smooth finish. The technology used to produce Fireline allows it to be ultra-thin yet very strong. Most beads will bot cut Fireline. It works better than fine beading threads due to it's extra strength. It is UV protected to withstand sunlight. The thread is pre-waxed so resists tangles. Fireline is also very stretch resistant.